In most cases, back pain will be a minor injury or a strain, self-limiting and lasting a day or three; rather than anything more serious. Physical sprains may pull on internal joints, nerves or tissue, causing inflammation and swelling. You could liken this to someone violently bending your fingers back. The fingers get very sore and swell up. Fortunately for hands that they don’t have the person weight bearing down on them after injury as the spine does. 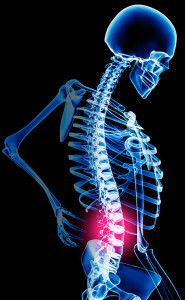 By design, the body weight above the painful injury pushes down to compress one or more spinal joints. The pressure irritates and distends the swelling within the joint triggering further inflammation and pain. This type of low back pain event can often be described as ‘simple low back pain’. In these cases, spinal discs the pads that cushion the spine have not been ruptured or damaged. Back pain symptoms often occur suddenly and can be triggered by a particular movement, but the causes may have been building for some time. How do Osteopaths and Physiotherapists treat back pain? Osteopathsand physiotherapists treat people using skilled hands-on techniques. Its a whole body system of medicine that examines the entire body. Detailed postural and injury analysis is used to identify sources of pain and restricted movement. These restrictions may indicate damage or impaired function.